A Tale Of Two Petitions. UPDATED! UPDATE: We have Updated this post with a note at the bottom reflecting a comment from one of the Palm Bay petition organizers. EDITOR’S NOTE: Our plans for this post and a post on the Waste Management contract in Palm Bay changed dramatically as we started putting them together and started writing them. We believe that the petitions and the Waste Management contract have a common theme – a common story line that runs through them. We will discuss that track in detail. However, this story – the story of two citizens groups in two Brevard County cities – has many twists and turns. It is not a story with one conclusion or one central point. It is a story that has many tracks and destinations, none of which we can answer because ultimately, none of the tracks have a satisfactory conclusion and all tracks leave more unanswered questions. Sit back, take a sip of your coffee and marvel at what is going to be a bumpy ride. A group of citizens in Palm Bay and Cocoa Beach each had the same desire, but different concerns. Both wanted to put a question on their local ballot this past November. As the respective City Commission and Council would not support the changes, the citizens went the route of collecting signatures on petitions to have their items placed on the ballot. The Cocoa Beach group wanted to put a referendum on the ballot limiting the height of buildings in the City and strengthening the regulations which citizens had previously approved and were now under attack by four members of the City Commission as well as influential outside interests of real estate agents, hoteliers, and builders. 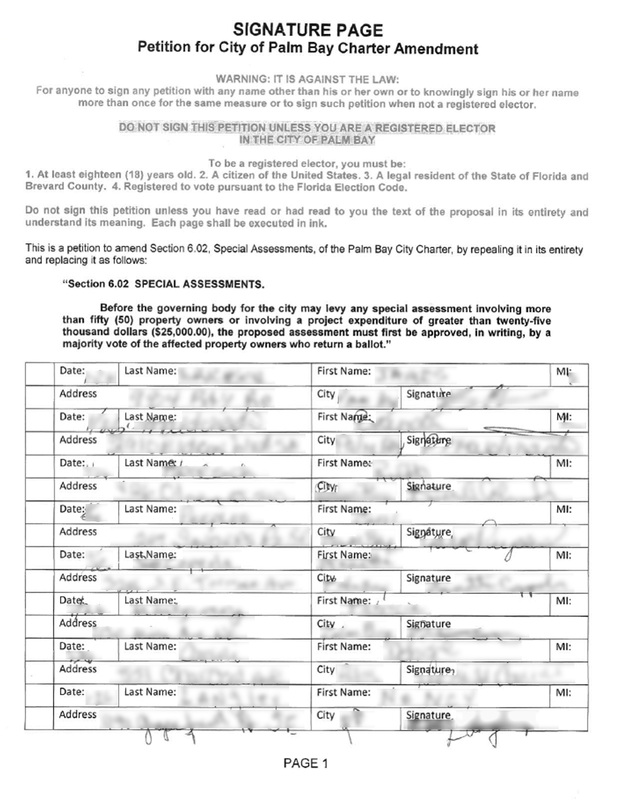 The Palm Bay group wanted to roll back or restore the language in the City Charter concerning the ability of the City Council to use “special assessments” that voters had changed in 2016. It was felt and argued by many that voters were deceived in 2016 as to the amounts the City Council would tax people in order to build roads in their area. Often times, these were roads that had been promised to the residents before and never built and the tax assessments were in some cases, more than the value of the land itself. People were angry, upset and felt betrayed by members of the City Council and the solution in the group’s mind was to roll the wording of the City Charter back. The Cocoa Beach group had a backer and an advisor in Commissioner Skip Williams. Williams did much of the leg work within City Hall to get the petition group going. By that, we mean that he made sure that the group was checking all the legal boxes in registering the group, helping guide the group through what was required as far as the language on the item, and trying to make sure that the group was on sound legal footing. That input from Skip Williams included working with the Cocoa Beach City Clerk to make sure of the dates the petitions needed to be submitted were met. The City Clerk contacted the office of the Brevard County Supervisor of Elections who told them a date when the petitions needed to be submitted for signature verification by the Supervisor of Elections to get onto the November ballot as well as what was needed on the petitions themselves. The Cocoa Beach group was told the petition needed to have the language of the item which is required by law. Each signature must have the printed name of the person signing it, the address of the person, including street address, city and county, and of course, the signature of the person. In addition, the person must provide the either their date of birth or their voter registration number. Duly armed, the group marched out into the hot Florida sun and started collecting signatures. The Palm Bay group was facing a different route. According to the Palm Bay City Charter, the group needed to register with the City and lays out the petition form itself. which all notices to the committee are to be sent, and setting out in full the proposed charter amendment, the proposed ordinance or citing the ordinance sought to be repealed. Within ten (10) days after the affidavit is filed, the city clerk shall issue the appropriate petition blanks to the petitioners’ committee. Both groups needed to have 10% of the electors (people eligible to vote in the City) but both groups were aiming for higher numbers as they expected that some signatures, when verified by the Supervisor of Elections, would be approved. 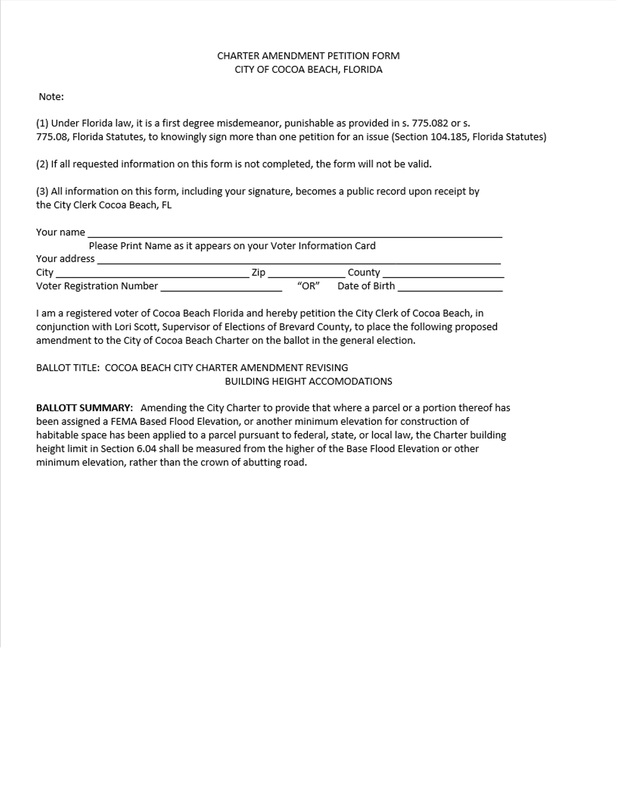 For Cocoa Beach, with a population of approximately 11,000 people, they were shooting for 1000 signatures while needing only roughly 800 signatures. Palm Bay was shooting for 10,000 of the 104,000 population while needing only a little over 7,000. The difference between the two cities requirement for the petition form itself is striking. Cocoa Beach told the group what was needed on the form and then approved it by consulting with the Supervisor of Elections prior to the group starting to gather signatures. 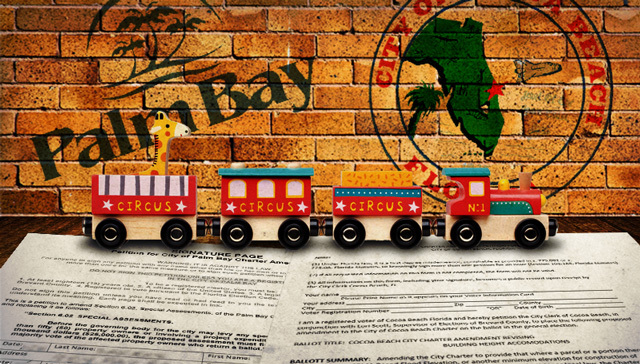 The Palm Bay group had to purchase petition forms from the City and was required to use them. They could not add anything to or deviate from the supplied forms. Most importantly, the forms used in the two cities don’t contain the same information required from people signing the petition. In both cases, the groups started to collect signatures. Both groups faced opposition from elected officials and in the case of Palm Bay, one Councilman conspired with his mother to try to catch the group doing something illegal while at the same time having his mother commit perjury by falsely signing the petition and stating she was a voting resident when she was not. It is not easy to stand out there, talking to hundreds of people on a daily basis trying to get a signature while facing opposition from elected officials. Both groups were tenacious, devoting incredible amounts of time and energy into their respective causes. We talk all the time here about citizens getting involved and the two groups did just that. However, without realizing it, the groups had walked into an area strewn with landmines. First and foremost was that to appear on the November ballot, the two groups were given to different dates as to when the petitions needed to be submitted. Cocoa Beach was given a date that was much earlier than that of Palm Bay. The Cocoa Beach date was allegedly confirmed with the Supervisor of Elections as was the different date for Palm Bay. Whether the Supervisor of Elections was giving different dates, or whether the respective cities and City Staff were giving different dates, the fact remains that for the same question – “when does signature collection need to be completed and submitted?” – the two groups were given two different answers. So the first part of this – the first track if you will – is that Cocoa Beach with an earlier date was forced to shut down a few hundred signatures short of their goal. Their referendum item did not appear on the ballot. Instead the City put on a badly worded item on the ballot. Boosted by the City government and PAC’s outside of the City promoting wrong and misleading information, the referendum was passed leaving some residents who voted for the referendum confused as they thought the item would strengthen the current height restrictions when in fact the restrictions were changed. However, like badgers, the Palm Bay group forged ahead. When the date for submitting the petitions came, they were short of the number they were looking for, but decided to plow ahead and gather more signatures. The reason for this was simple. While the City had placed on the ballot a bond referendum for roads that was much more palatable to citizens (and which passed) the group still wanted the language in the Charter rolled back so that citizens could never face taxes far out of scale and for more than the property. The burden of having the issue on the November ballot had been removed, but by gathering the correct number of signatures, the group could force the Council to put the item on the ballot in 2020 or even force a special election. The group eventually took their completed petitions with slightly less than 9,000 signatures on them up to City Hall and turned them in. The City looked over the petition pages and agreed it had met the City criteria and sent the petitions off to the Office of the Supervisor of Elections for signature verification. Months passed and there was no word on the status of the verification process. It was as if the petitions had dropped down a black hole at the Elections office. Calls were made by the City to check on the status. Calls that were never answered. Messages were left and not returned. The silence was deafening. After several months, the City finally heard back from the Supervisor of Elections. The petitions – every single one of them – had been rejected. The reason given was the petition form did not contain the date of birth and the voter registration number. Not the date of birth or the voter registration number as was told to Cocoa Beach, but both the date of birth and the voter registration number. This to us is another part of the different tracks of this story. Once again people had two different requirements for the same thing. 4. Had not ever previously signed a petition form containing the identical initiative. 5. The date the voter signed the petition, as recorded by the voter. The actual rule deals with the petition process for signature verification for a Florida Constitutional amendment, but the standard would apply to local signature verification. On February 7, 2019, two members of the Palm Bay petition group, Thomas Gaume and Randy Wickens, spoke to the City Council. Their comments can be seen starting at 37:00 of the meeting video on the City’s website. The gist of their comments were that they had met the requirements of the City had given them. They rightfully pointed out that the Charter prevented them from using any other form than that provided by the City. They could not modify or change the form and had in fact paid for the form. The group doesn’t want to be caught in that crossfire and rightfully so. The speakers then asked that the City, knowing that nearly 9,000 people had signed the petition and knowing that the group had met the signature goals do the right and moral thing and put the referendum on ballot through a City ordinance. That course of action is the track the petition group is on. Tom [Gaume of the Petition Committee] and Randy [Wickens] …… because Tom came by the legislative office, and I happened to be there and he sat with me and we talked. And another thing that transpired after that and that’s why I need for you guys to be patient. I spoke with [Supervisor of Elections] Lori Scott. She called me, I called her back, and there’s things that I need to sit down with [City Clerk Terese Jones] and our City Attorney before I can give you a final answer. And all that I ask Council is to give me that latitude to be able to sit down with our City Attorney’s Office and our City Clerk’s Office in order to move on this. I know that it seems unfair at this time, because patience is a virtue, but all that I am asking you is have patience with me. I’m not overlooking you. The fact is that I also have to look at the interest of the City. Because there are some discussions that I need to have with the City Clerk and the City Attorney in order to move forward. And that’s all that I am asking. I’m not brushing you off. This comment from the Mayor is typical of him. It rambles and when dissected, says nothing of substance. because Tom came by the legislative office, and I happened to be there and he sat with me and we talked. This meeting took place on Monday afternoon prior to the City Council meeting. That gave the Mayor part of Monday, and all of Tuesday, Wednesday and Thursday to work on an issue that he had to know was going to be brought up on Thursday night. To be fair, the City Attorney was out sick on Wednesday, but that still gave the Mayor two days and a portion of another day to meet with the City Clerk and the City Attorney. Frankly, when you have a situation that was screwed up as badly as this one, you clear the decks of other things going on. In asking for more time, the Mayor demonstrated that he was not ready for an item that was going to be brought up at the Council meeting. The failure to be prepared was not a failure of time, but time management and a priority to deal with an issue that had been brewing. …….that’s why I need for you guys to be patient. And all that I ask Council is to give me that latitude to be able to sit down with our City Attorney’s Office and our City Clerk’s Office in order to move on this. The City Clerk and the City Attorney are in the same meeting. If the Mayor looks to his left, he can see them, wave to them, talk to them. The same information they would give him should be given to every one of the other four City Council members at the same time. There is no need for a behind closed door session out of the view of the public and out of the view of the rest of the City Council. The proper remedy for the City requiring the petition committee to use forms that were not up to the legal standards that have been in place for 13 years is not “we need to get out of the public eye.” The remedy is to take a vote and see if the City Council wants to put the issue on the ballot. Those are the only two options: verify the signatures, (which cannot happen) or put the item out for a vote by the City Council. Neither option requires, demands, or needs a closed door meeting with only three people in attendance and where no records, video or transcript of the meeting is made. That would leave the members of the petition committee facing the prospect of either walking away (and in doing so dismissing the concerns of 9,000 citizens) or filling suit against the City which would require them to pay for a lawyer, etc., for the City’s faulty, and arguably illegal (if not incompetent) actions. The Mayor doesn’t have to dole out a penny to defend the City, but the people who want the City to correct the City’s wrong would have to pay money out of their pockets as well as pay for the City’s legal fees. That’ totally unacceptable by any objective standard. The fact is that I also have to look at the interest of the City. This is where our “track” on this story comes in. You’re going to hear this refrain again in the next few days as we talk about the Waste Management part of the agenda from the February 7, 2019 meeting. In the “interest of the City” is an open and transparent government. Instead of addressing the corruption issue and being transparent, the Mayor in this case (and as you will see in the Waste Management case) wants to put everything behind a door where no one can see it. You don’t build or rebuild trust in the City government by hiding things. You don’t say “there is no corruption” and then have more meetings behind closed doors on issues impacting the public. And frankly, we have no idea even what “interest of the City” means. I would call the City Clerk’s frequently to ask about the status of the petition. The answer I received each time was “It’s been submitted to the SOE and we are waiting on word back from her office”. Only after stating that I had an upcoming event where the SOE would be present and stated that I would ask her about it did it come to light that there was something going on. The answer on that day was that the Clerk needed to check with the City Attorney to see what the status was. This was at about 3:30 on January 25th. 3 months after the Petition had been submitted. There are only two possibilities here and neither of them are good. 2) The Supervisor of Elections failed to do their job which requires the signatures be verified / not verified within 30 days – not three months. We’ll let readers decide which option they want to believe or look into. Tomorrow (and maybe Wednesday) we fisk the comments of the Mayor on the Waste Management contract. He wants behind closed door negotiations. Just one point of correction. My statement that I was going to talk to the SOE apparently blew the lid off of the powder keg, because in the next two hours I received a phone call from the City Clerk, two City Council members, and the City Attorney. When I met with the Mayor on the 4th of February he was aware there was an issue prior to that meeting, but did not seem to know some of the details, such as the Committee having to purchase the signature forms from the City. What seems apparent is there is a concentrated opposition to the petition process called for in our City Charter and that both the Charter and the City leadership itself are deficient in being compliant with Florida statutes. We feel as though the Citizens of Palm Bay are entitled to a Special Election as the committee has met all of the requirements put before it, many were over and above the requirements of the City Charter. One other item not mention is one of our members was actually arrested while collecting signatures and is still facing charges. I’ll not comment further on this subject as it is still (1 year later) an active case before the courts. It seems apparent there is much “stalling” going on. ANY communication on this should be out in the sunshine where it belongs. These comments by the Mayor in that he is the “only one” that should have these conversations with the clerk/attorney is troublesome for me as well.Transparency is a BIG issue in our city. Transparency and the “C” word are/were two big issues discussed this past election cycle. Let’s not start taking a step backward, but instead forge ahead and allow the people the right to vote. Please Mr. Mayor (and council) put this on the Ballot in 2020, and I suggest a moratorium on any special assessments in the interim. Save the tax payers the cost of a special election. It has recently been disclosed that the petition to restore charter language to its pre 2016 form regarding special assessments in the city of Palm Bay has been rejected by the supervisor of elections. The rejection of the petition signatures was due to being submitted in a format not consistent with the SOE’s signature verification process as required. I am also aware that the petition signature collection pages were created by, and provided by (at a cost) to the petition committee by the city. This proves to be quite a conundrum and smacks of duplicity on the part of the city to thwart the will of its constituents. The petition signature gatherers performed their duties in good faith, and consistent with the officers of the city providing the forms. Mayor, you have an opportunity right now, today, to do the right thing and announce that this referendum will be on the 2020 ballot. The taxpayers do not need or want the cost of a special election, but they do want, no they demand, that their voices be heard and heard without interference and further skulduggery on the part of the city and its officers. The constituents of this city have been victims of poor decision making, lack of transparency and the interests of a few being put before the best interests of all for years. Again Mayor Capote this lands at your feet, this is on you. Do the right thing. Again like I’ve said from day one helping get signatures with serve health issues walking door to door, standing out at First Friday’s at the Bay, going to Special Events. This town is STILL being run by a few of 🤡🤡🤡. The City knew from the very beginning along with Lori Scott what this was All about along with reasoning. Mayor you have made this comment many many time you know at the end of the day you can put your head on your pillow because you have done the right thing. Well Mr Mayor if you Vote against this you well know when you but your head on the pillow you have done the incorrect thing. Please but this on the ballot for the people to Vote. Seems pretty straightforward, the city made a mistake by forcing its residents to circulate forms which could never be validated by the SOE. Since the petition process is rarely used it most likely was just an oversight, but a mistake all the same. The only option would seem to be for the city to acknowledge their mistake and place the item on the ballot for the citizens to decide. Also, the city should immediately correct their petition form to avoid future problems. I agree with other commenters in that this is the time for the elected officials to do the right thing which will also help restore trust in their local government. There are two things that bother us about this. The first is that the requirement for DOB or voter registration number has been on the books since 2006. It is hard for us to imagine that no on has embarked on the journey of a petition initiative before in the last 12 years. It also seems odd to us that no one in the City kept on the law. Isn’t that what they get paid for? Secondly is the time frame for approval. If the City knew about the refusal 3 months ago or even 2 months ago, why didn’t they say anything? If the City didn’t send the petitions to the SOE, that’s a whole different level of incompetence and malfeasance. If the SOE took 2 or three months to do something that is required by law to be completed in 30 days (and in this case would have taken literally seconds,) what happened there? We agree that the City Council should vote to have the item on the ballot. We also think the City should refund any money the group paid for the worthless forms. Lastly, there needs to be an accounting as to the time frame of when the petitions were sent out, when they were verified, etc. We wonder if there is a stamp or something that says when the SOE got the petitions. Not matter what, when it comes to the timing of the petition verification, someone or some group screwed up. Now that the road bond has been approved by the voters, the money has been received by the city, and the roads are beginning to be repaired, the City Officials should stop the charades, show some good will toward the voters, and voluntarily put the article on the next ballot to do what the City Charter petition initiative has so far been unable to do, in rolling back the the language in the City Charter to it’s original form, with respect to Special Assessments.